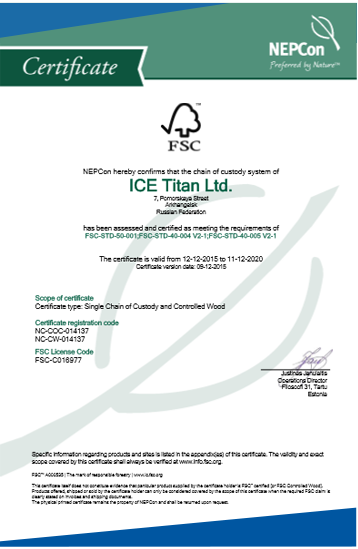 One of the strategic aims of the Titan group of companies is supplying its partners with FSC™ certified raw materials and responsible forest management. The company received its first FSC certificate in 2005, and later successfully went through recertification in 2010 and 2015. As a member of the “National working group for voluntary forest certification” Association, as well as the Technical committee of the Association, Titan actively participates in the formation of new Russian FSC standards, aimed at creating stricter requirements for certificate holders. Guided by the Russian forestry legislation, and in consideration of the state of the current and the project of the new national standard of FSC forest management, the “Titan” group of companies began developing a strategy of forest management on leased forest territories for the period until 2025. The WWF of Russia was invited to participate in the development of this strategy, and Greenpeace of Russia was invited as an expert. Moreover, in 2013 the “Titan” group of companies signed four voluntary moratorium agreements with the WWF and Greenpeace, thereby assuming the obligation to preserve intact forest landscapes, and stop logging works on leased territories with a total area of more than 242 00 ha (6/4% of the total volume). Moreover, by confirming its commitment to the principles of sustainable ecological and socially responsible development, “Titan” holding supported the creation of the Verkhneyulovskyi reserve in the interfluve of the Northern Dvina and Pinega with a total area that is no less than 350 thousand ha, of which there is a significant part of forest land leased by GC “Titan”. The Verkhneyulovskyi reserve will become the sixth specially protected nature territory SPNT in the Arkhangelsk region.